Open gondola 511625 (number is a little unclear), carrying concrete ties, westbound at Pinecliffe (12/05/2008). Open gondola 516458 and another unidentifiable gondola, loaded with concrete ties, moving on a trackage rights train on the Moffat. Not your typical roster shot. You can see the rib-edge panels attached for the new-image logo and the reporting marks. Westbound at Rollinsville (12/05/2008). 5-unit well car for doublestacks. 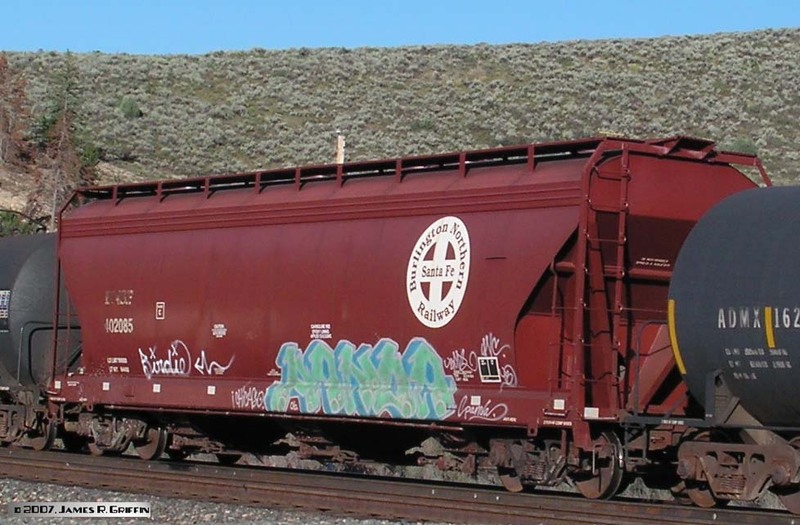 Number not legible in the photo, but definitely BNSF reporting marks. Eastbound near Flagstaff (3/27/2008). 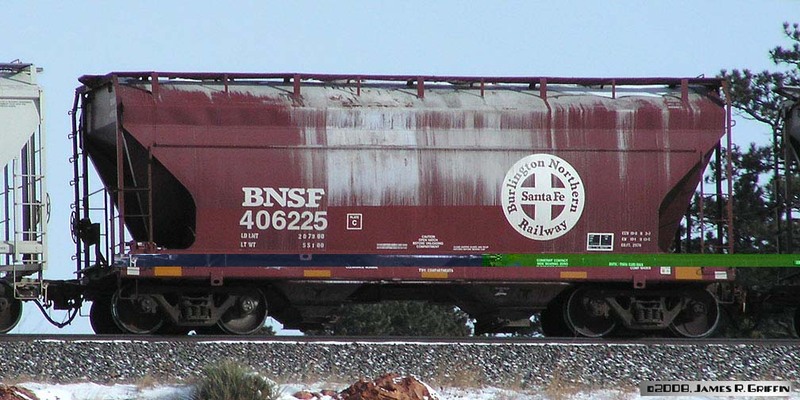 A Santa Fe 3-bay ACF covered hopper, No. 313809, is spotted at Rincon on 5/09.2010. Still in its original paint scheme some 15 years after the merger, it’s looking good. Three-bay ACF covered hopper No. 402085. Wears the first merger herald (pre-2005). Westbound at Sulphur (8/09/2007). 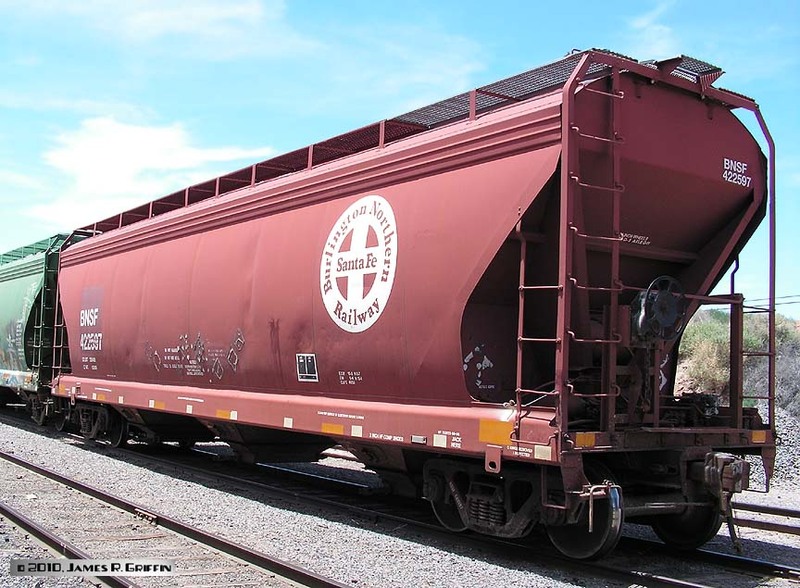 Three-bay ACF covered hopper No. 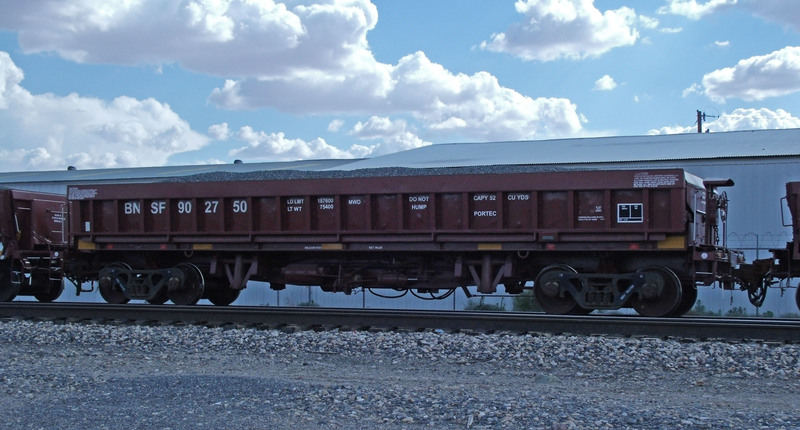 422597, a 4650 cubic-foot capacity car in the original merger scheme. It’s spotted at Rincon on 5/09/2010. Covered hopper No. 436932, rib-sided. 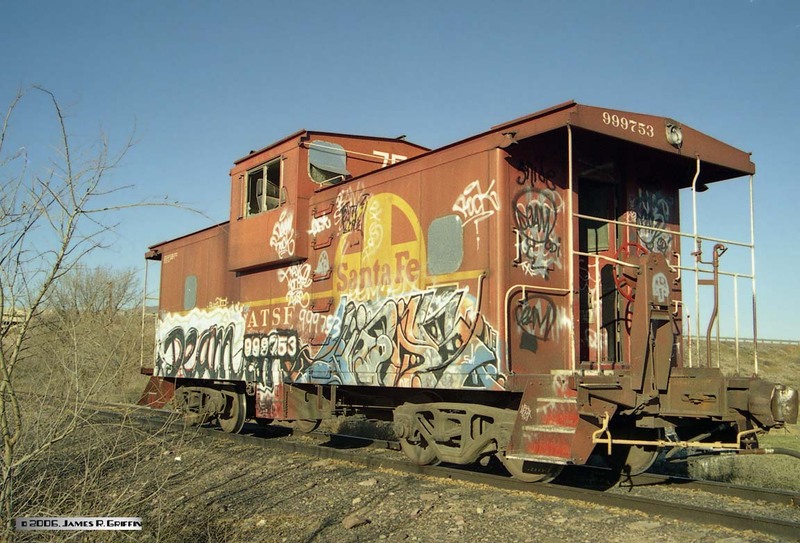 It’s a repaint built in 1980, and sports some of the more creative graffiti I’ve ever seen. Photographed at Rincon on 5/06/2016. Covered hopper 469122, northbound at Las Cruces on 8/15/2010. It wears the New Image lettering. 3-bay cylindrical hopper No. 479363, northbound at Las Cruces (8/11/2009). Built by Trinity. 3-bay cylindrical hopper No. 480914, northbound at Las Cruces (8/15/2010). 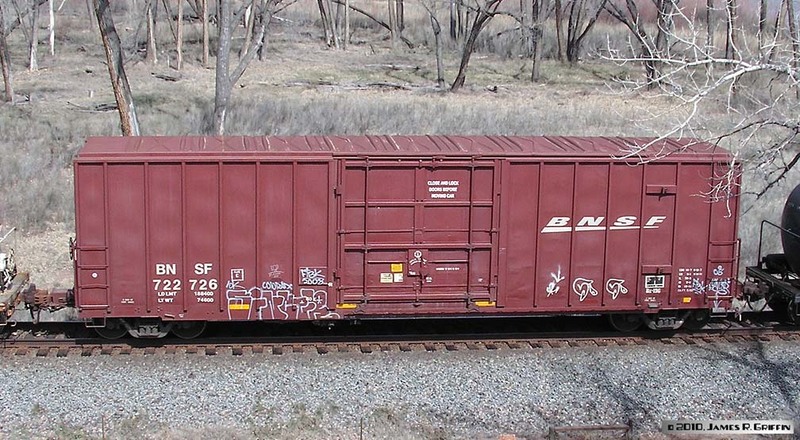 50-foot modern boxcar 722726, in the new Wedge scheme. 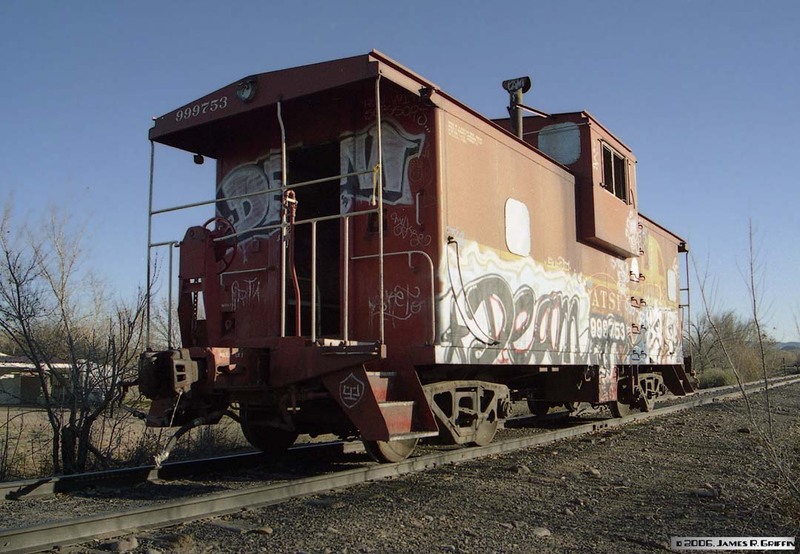 This car is seen on UP’s North Fork sub near Delta, CO on 4/16/2010. 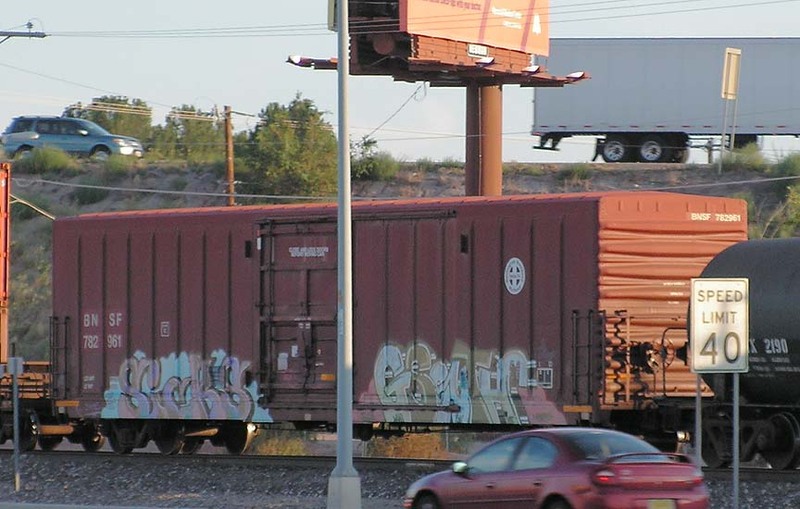 60-foot Boxcar 781628, at Gallup on 9/11/2010. 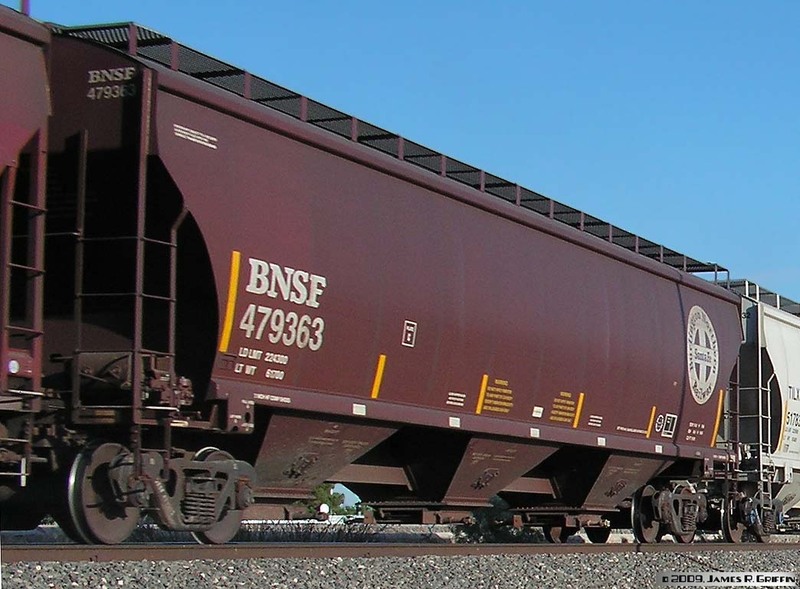 Earlier BNSF merger herald. 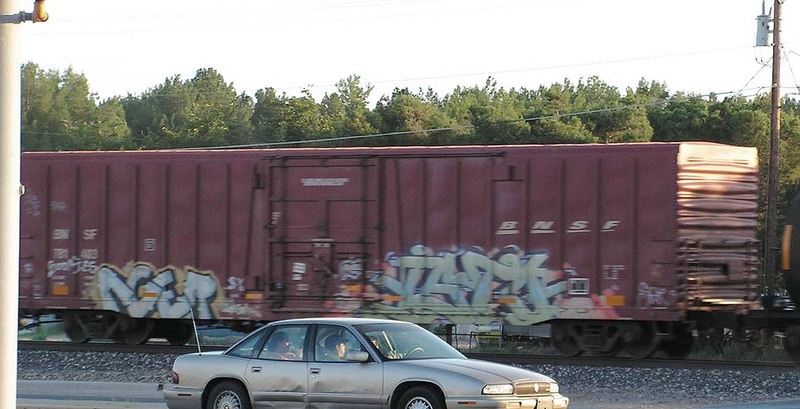 There was a sizeable block of these cars on the train. 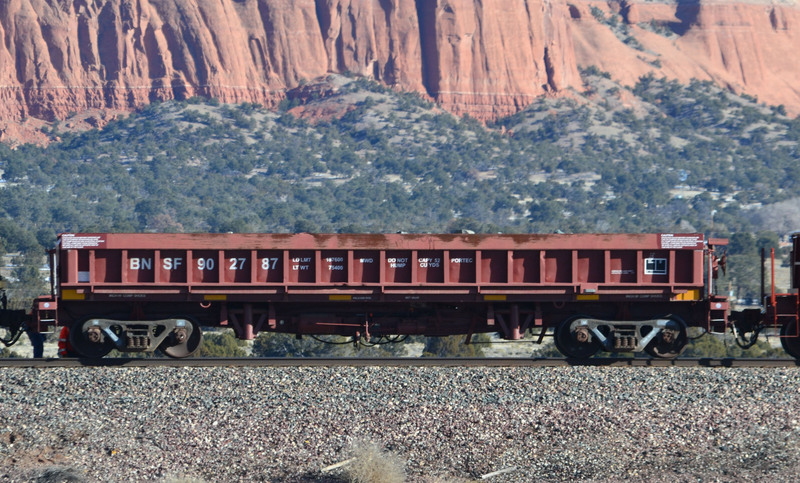 60-foot Boxcar 782235, at Gallup on 9/11/2010. 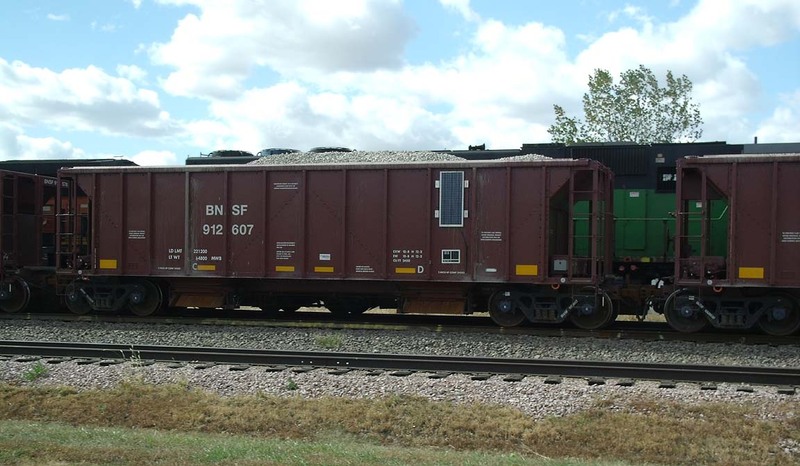 Earlier BNSF merger herald. 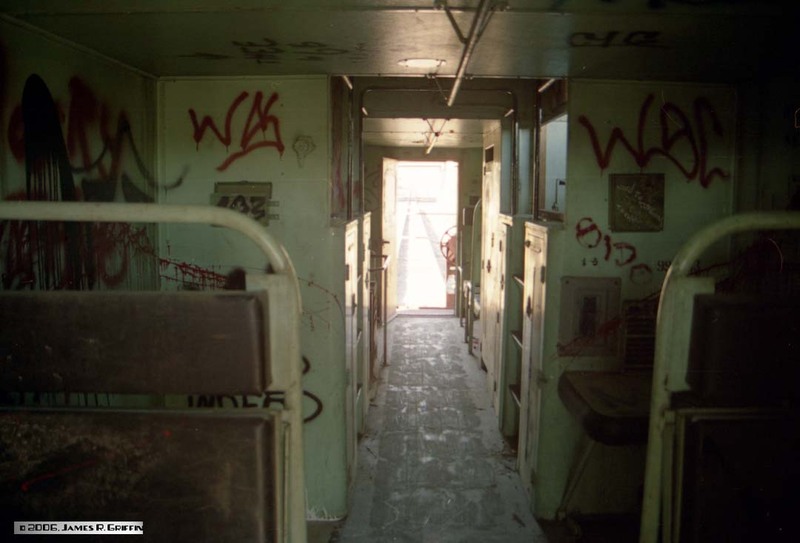 Pretty sure that this is relettered from ATSF marks. 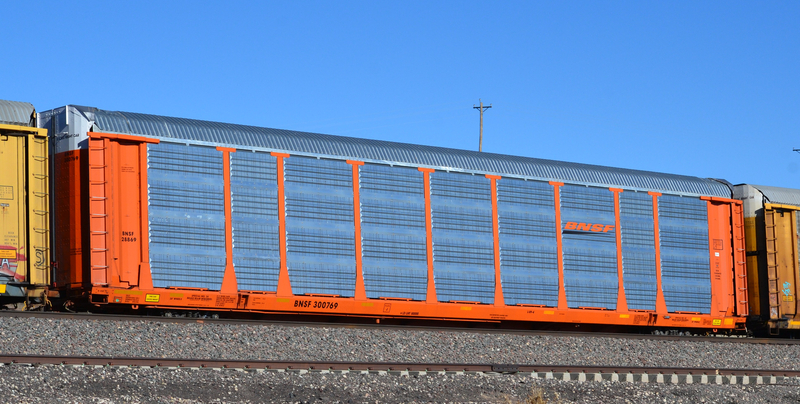 BNSF tri-level auto rack, riding on ETTX flatcar 711097. 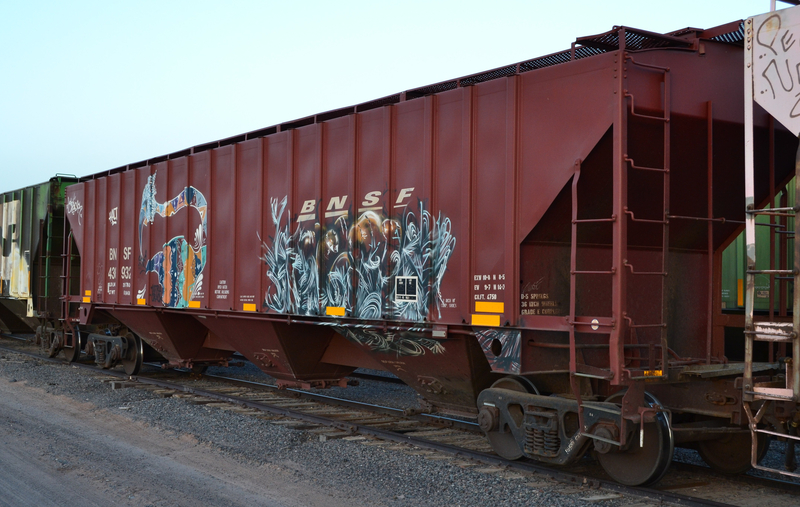 It’s on a westbound BNSF train at Belen, 10/30/2009. Original merger logo applied to one end only, with no separate herald panel. 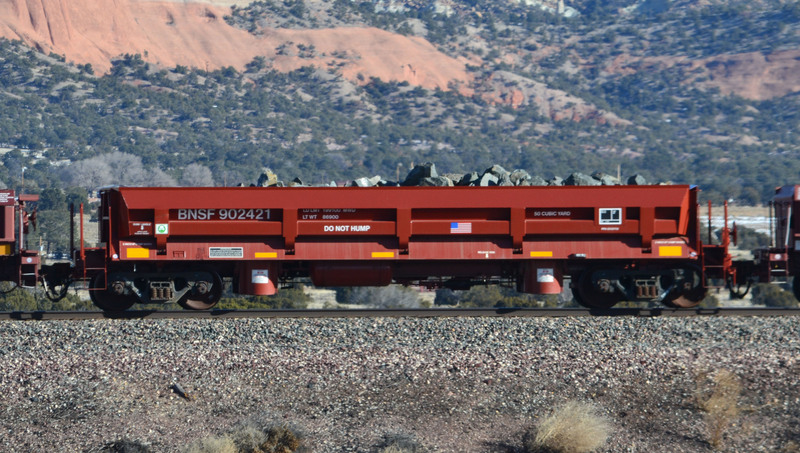 BNSF tri-level auto rack, riding on ETTX flatcar 852848. 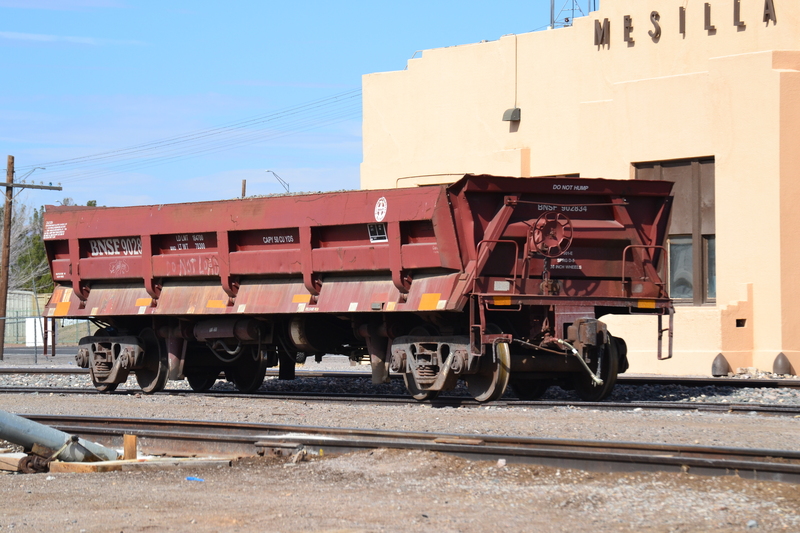 It’s on a westbound BNSF train at Belen, 10/30/2009. Original merger logo applied to both ends, with no herald panel. Autorack on TTGX 952353, rack No. 26044. It has the New Image herald. Seen in Gallup on 12/27/2017. 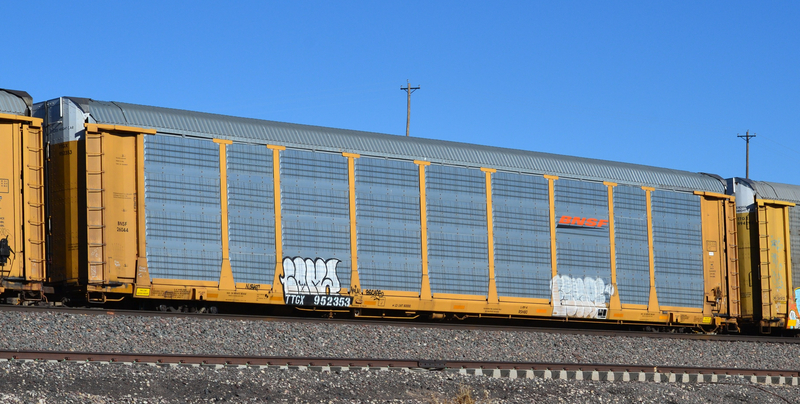 Autorack on BNSF 300769, rack No. 28869. New Image herald. 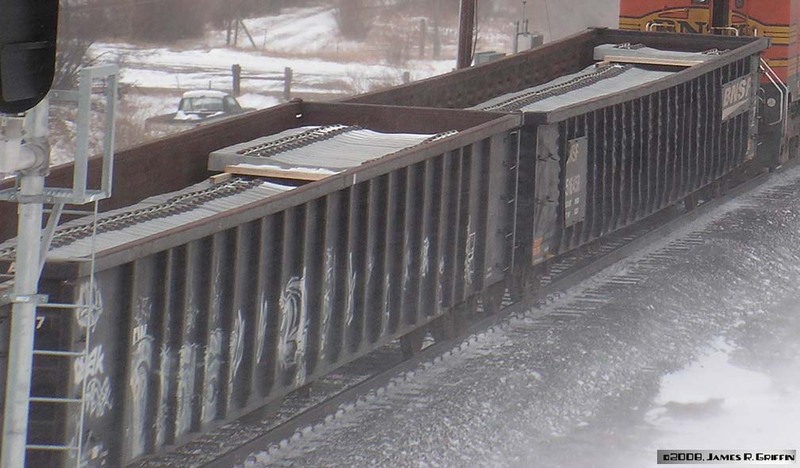 Notice how the end of the rack is stenciled with the flatcar’s number, not the rack number (this is usual practice, just an interesting detail). This car is so new, it doesn’t even have graffiti yet! 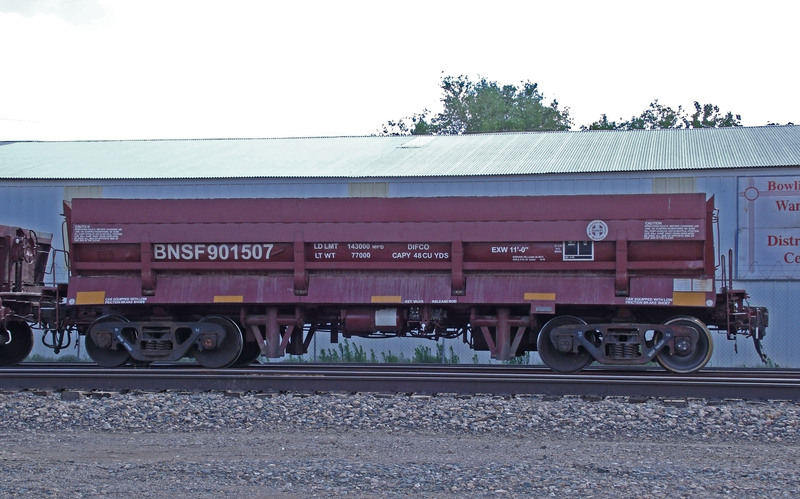 Bi-level autorack on BNSF 300329. Rack number has been graffitied over. This car has the “wagon wheel” herald on a panel. Multi-Max autorack No. 34319 on CTTX690469. These racks from Gunderson (Greenbrier) have on-site-adjustable racks, enabling shippers to switch between two and three decks without having to actually remove one. Note the broad yellow panels towards each end. 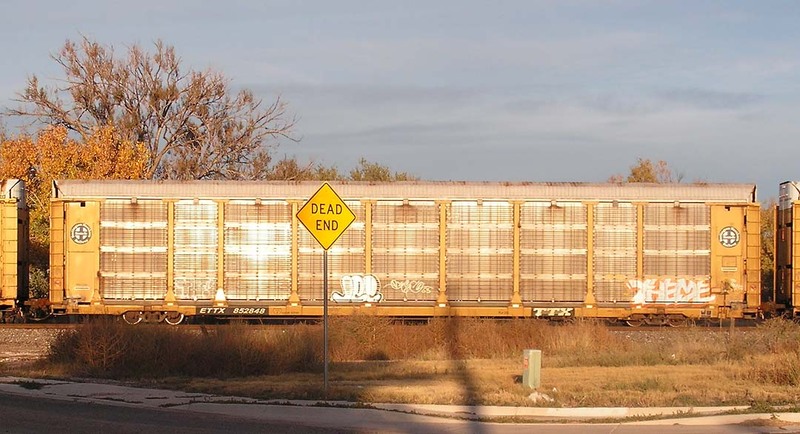 Tri-level autorack on ETTX 907697, rack No. 30097. 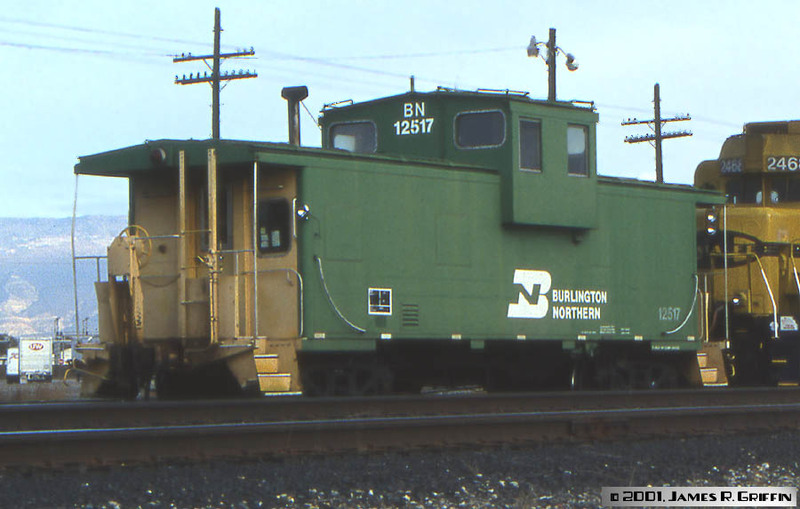 BN Caboose 12517. This car was kept in Grand Junction (may still be there for all I know) for locals use. 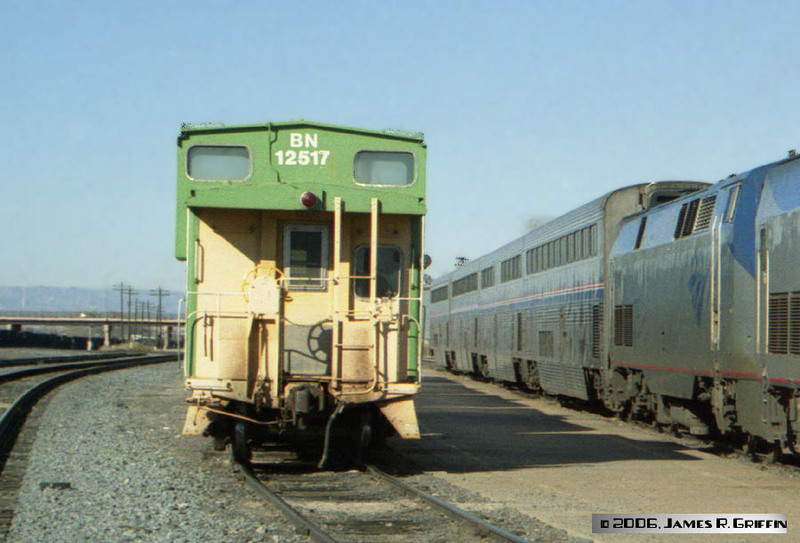 Also built by International, but note the offset cupola– likely built in the mid-1960s. Bottom: Spotted near the depot on Jan 5th, 2006. 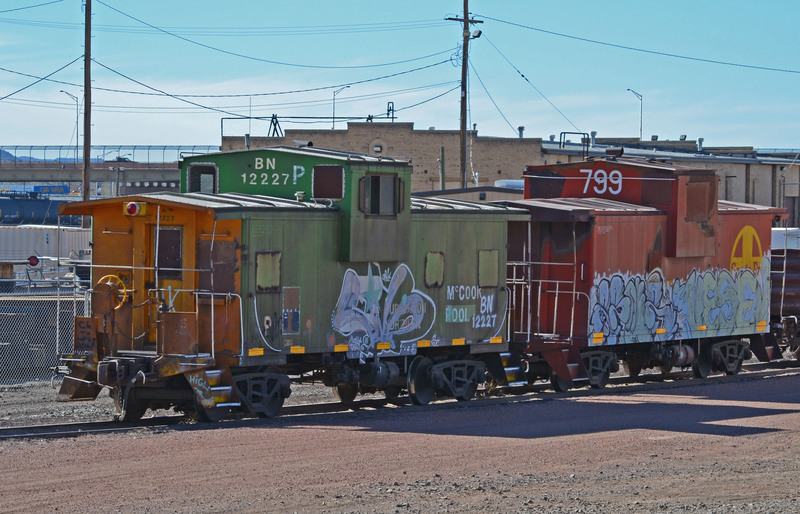 Two wide-vision cabooses, or what’s left of them (BN 12227, ATSF 99799), at Gallup on 12/27/2017. 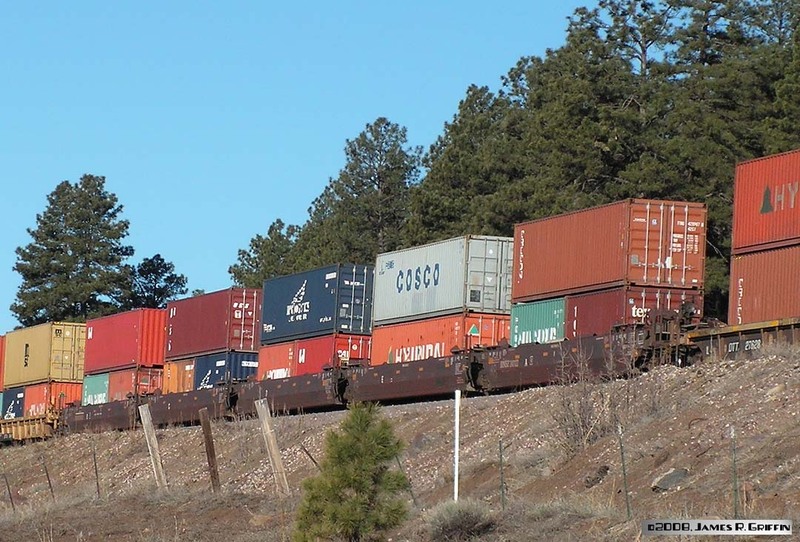 Both built by International, and representing the two major pre-merger component railroads, literally all of their windows have been covered by this time. They still see some use on local movements in the area. 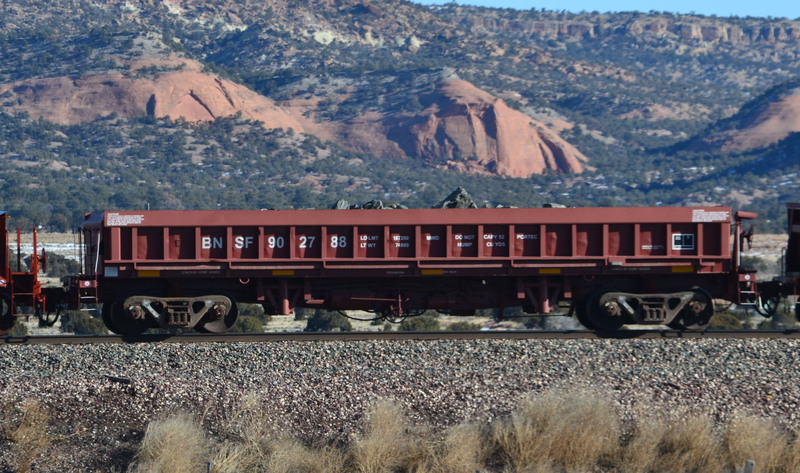 Side-dump 50 cu yd ballast/rock car 902834, seen at Mesilla Park, NM, 2/15/2015. 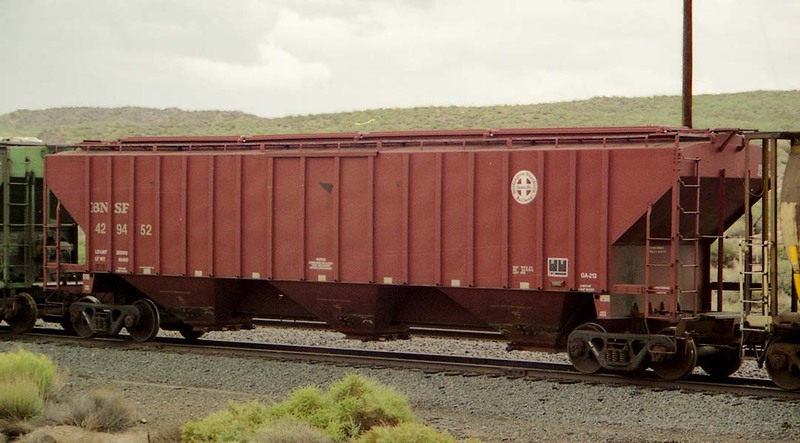 Side-dump 50 cu yd ballast/rock car 902421, Thoreau, NM. Note it is loaded with rock. 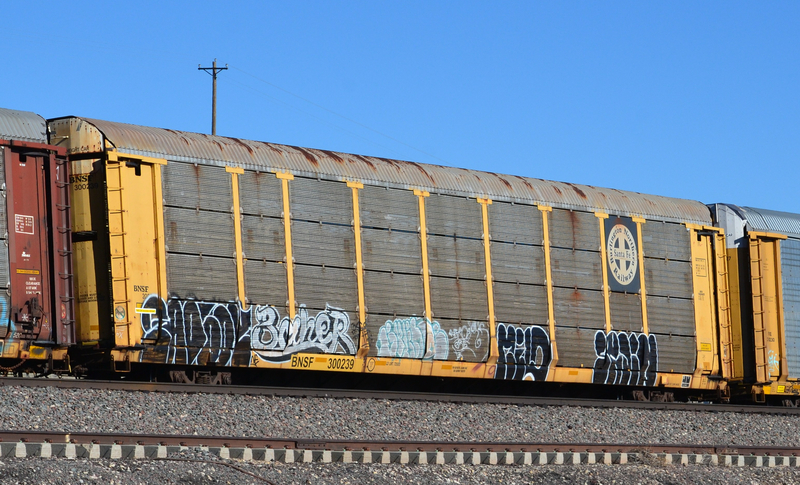 Maintenance-of-way flat 930509, seen with a load of panel track in Denver on 12/16/2014.